my life as a brownie. : marrying off children. This morning I read an article on BBC- What is it like to be a child bride? The stats were out of this world "Some 10 million girls a year are married off before the age of 18..."
It is surreal to think that this exists in our world today. Being brought up in Canada, we have the freedom as women and men to do whatever we please and make choices to be single, in a relationship, divorced and so on. However, in India this is not the case... yet. 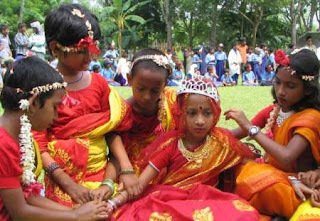 The laws in India have shown that it is ILLEGAL to have child marriages, yet it openly exists. Women are still looked as a burden in many families in regions throughout India. Also, the dowry system is prevalent. ("the brides parents offer dowry to the grooms family in the form of money and materials. This is in order to help support the livelihood of the bride until groom grows up to support her himself"). Not only that but people do not like change. If a system as been a way for so long, they want nothing to change that system. "I hate the government for trying to stop us. This is the way we've always done things. The government bans this, saying do not get under-aged children married, but we don't care and we do these weddings anyway." - A bride's grandfather says in his interview on BBC. Surely, one day India will CHANGE and as an optimistic person I am, I believe they can CHANGE for the better. Below is the link for the BBC article- it's a good read. Also if you have the time, you can watch a documentary on child marriages- an unsolved fact (a child marriage). Below is the YouTube link on all parts. Kiran Dhillon did her IPP last year on arranged marriages.